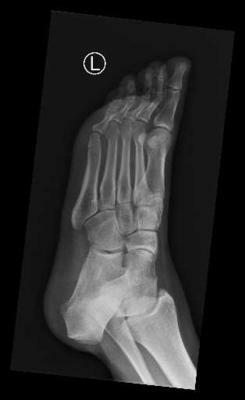 5th metatarsal fracture slow union? Hi, 7 weeks ago I fractured by 5th metatarsal playing basketball. It was quite tender to palpate over an area which swelled up, so I presented at ED. An xray revealed a non-displaced, incomplete oblique fracture mid-distal shaft of 5th met. I have been wearing moon boot and hard soled shoe (am not allowed moon boot in student clinic). Pain and swelling mostly subsided by about 3 week mark. 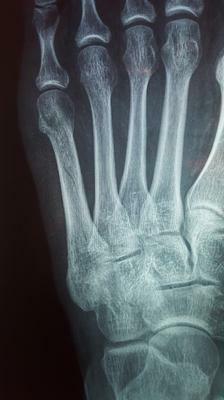 I had a follow up xray at 6 weeks, which showed the fracture line still clearly, and suprisingly no periosteal reaction. The radiographer and my GP thought this was a bit weird. GP suggested wearing the moon boot for another 3-4 weeks and repeat xray. I am getting some pain and unusual gait from wearing the moon boot due to limited ROM in ankle. In my office, I routinely recommend bone stimulators for all fifth metatarsal fractures. We use them from day one of the trauma, since statistically many fifth metatarsal fractures will go on to non union. Non-unions are very common in this type of fracture even in situations where the fracture is non-displaced and we are dealing with an otherwise young healthy individual (you!). The reason this type of fracture is so prone to non-union is because of the poor blood supply to this specific area. As the name implies, a bone stimulator will stimulate the healing process through ultrasound. Here is the States, years ago, insurance companies would not pay for a bone stimulator until 12 weeks had passed and a non-union was confirmed. Then the patient would have to wait another 2-3 months of using the bone stimulator and hope that it worked. Further complicating the problem was the type of non-union the patient experienced as there are different types and some will eventually heal with a bone stimulator while other types will not. So medicine got smart and insurance companies started paying for the bone stimulator right from the start. In your case there are other considerations. If you are a smoker that will delay fracture healing or may even prevent it outright. Additionally, you ask about a surgical or post op shoe. I do not think that is going to make a difference. Bending your ankle may actually put more pressure on the fracture site and work against healing. If you really want to "move this along" and try and avoid surgery, then my recommendation would be a bone stimulator and go non-weightbearing on the foot with the use of crutches. This is something you should discuss with your doctor and see if he or she is in agreement. 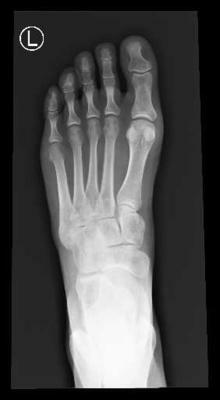 Comments for 5th metatarsal fracture slow union? Thanks so much for your reply. I am a non smoker, don't drink much alcohol at all, and have no known underlying medical conditions.